I'm now moving on to the Making A Mark Awards where I've previously identified both contenders and winners. When I started these Awards back in 2006, I wanted to try and identify excellence in blogging art and the blogs which were the most influential. In order to avoid spurious accuracy, I decided to refine that as being those blogs which had most influenced me. In 2009, it seems appropriate to open up the identification of excellent blogs to the wider community of art bloggers - and what influences YOU. I'm still going to decide the winner of each award at this stage - and will also be identifying a few contenders of my own. However I'm interested to hear what you all think too. Today I'm looking at nominations for two awards whose winners have a set a high standard to date. 2008: Different Strokes from Different Folks. 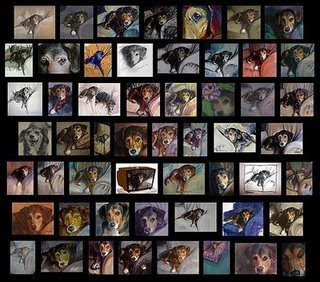 The Best Art Blog Project Virtual Challenge Cup - I'm not sure if this qualifies as a Virtual Challenge, but I nominate Gabi Camponario's Urban Sketchers as a project that has grown far beyond the 100 correspondents on the USk blog, with it's presence on Flickr and Facebook as well as individual cities that have started their own urban sketching branches. I believe it has encouraged many people to start viewing the places in which they live and travel differently, and either to begin sketching for the first time, or to take it up again after a hiatus, or to expand their subject matter to include urban scenes. The variety and vivacity of the posts on the Urban Sketchers site is consistently inspiring. That definitely counts as a project Cathy - thank you for your nomination. Urban Sketchers is also a good example of a project which was set up before 2009 but has continued to grow in significance. I'd like to nominate the Virtual Paintout http://virtualpaintout.blogspot.com/ for The Best Art Blog Project Virtual Challenge Cup. It is a mix of reality and technology as Bill Guffey hosts a different city each month on Google Street Views. Artists meander through city streets virtually, choose a view, paint and submit it for posting. It broadens people's horizons as to what other parts of the world are like in finer detail, encourages compositional skills and provides a forum for artist's work. I'd like to second Jeanette, the virtual paintout blog for the best Art Project blog. I love the whole idea of painting from streetview, and it provides a world of opportunity to virtually travel around various places and pick what interests you most. The end results bring out much more than standard postcard views of any place and I love it! I would also like to nominate Bill Guffey's Virtual Paintout http://virtualpaintout.blogspot.com/ for The Best Art Blog Project Virtual Challenge Cup. Participating in this is really an adventure, as everyone has to find their own subject location on Google Streetview -- and the resulting very diverse array of entries is fascinating! I also nominate Urban Sketchers for the best art blog virtual challenge cup. 2009 was its year and wow has it grown and spread! 2010 will be even bigger. And the posts and sketchers are all so completely different, and have inspired so many to become urban sketchers themselves. i'd like to nominate my site: www.cotswoldsketchbook.co.uk in the painting a day stickability category, I've been doing this since April 2009 and havnt missed a working day since! yet! I paint the landscape in the area I live and occasionally where I am on holiday. Its proving to be quite popular and the word is spreading, thanks for all you do to encourage other artists.. I would like to nominate Loriann Signori's painting-a-day for the Painting a Day Stickability Shield. Loriann has been blogging since October 4th 2007. 98 beautiful pastel paintings. For 2008 she posted 309 beautiful pieces. Currently as of today December 15 she has posted 315 pieces. Not only are her paintings beautiful, they are instructional as well. Most posts describe the process and encouragement for others to keep painting. Loriann's blog is very inspirational to all that visit. She has won many awards in juried shows throughout the east and midwest. Loriann is dedicated to the process and committed to posting daily. My name is Doug Daniels http://www.doug-daniels.blogspot.com. Thank you for considering Loriann's blog.